I am by training and vocation a librarian. Depending on the industry and employer needs my title has varied, but acquiring, verifying, and sharing information have been central to every position. Perhaps because of this I am slightly passionate about the importance of process in research practices. Research pertains to much more than the typical full-blown formal research paper. Research includes all information seeking behaviors. Even students listening to a lecture are engaged in research, albeit passive and single-sourced. They are gathering and organizing information to develop new understandings. 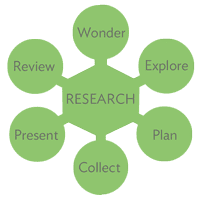 Wonder: Establish the topic of research. This will be refined, and perhaps completely altered in future steps. Explore: Quickly and superficially begin to look for information about this topic to gain a better understanding and begin to formulate deeper questions. Plan: Consider all information resources, keywords and search phrasing, information format and media. Collect: This is the biggest and most time consuming task. This is where all of the planning in previous steps is acted upon. Sometimes researchers need to go back to Wonder and reevaluate the entire project based on new findings. Present: Gather found information and new understandings into some sort of presentation or product. It may be a written paper, a multimedia presentation, a verbal discussion, notes for personal edification, or as simple as a satisfied curiosity. Review: Go back and evaluate the final result. Ensure that the primary question has been answered. In the coming weeks I will share strategies and tools to use when guiding students through the research process.